In his research on scheduling, the author of Deep Work, Dr Cal Newport, finds that in an age of distraction, it’s not the frequency of work that leads to productivity and satisfaction but the depth and level of concentration we are able to achieve. However, much of the productivity advice given to academic authors is still based on research conducted by psychologist Robert Boice in the 1990s. Boice’s central mantra was that academics should ‘write daily’ and he linked lack of career progression and even depression with methods such as ‘binge writing’. Of course, this type of advice can be useful, but it’s also very rigid. It says there are certain things you should do (and should never do) to be productive and implies that if, for whatever reason, you can’t do those things – you’ve ‘failed’. The most productive scholars are those who block out time to write across a week or a month and schedule their writing time in those sessions. Academics are most likely to start using this method as they approach mid-career and are least likely to use it at the beginning of their career – perhaps when career pressures and daily interruptions aren’t as high. The research indicates that time blocking works for authors because it helps scholars compartmentalise their time and so be more prepared when a writing session is due. The study finds that scholars who write a little every day report feeling significantly more satisfied with their writing process overall than those who use other methods – but that doesn’t mean they’re more productive. In fact, we find that daily writers are less productive over the course of a career than those who use the time-blocking technique. This finding contradicts much of the research in this field which suggests that daily writing is the ‘gold standard’ of writing productivity – research that has informed writing programmes, seminars and courses across the world. The academics who say that they predominantly write in long stretches of time – such as on holiday or on sabbatical – are by far the least productive and satisfied. These academics were also more likely to be held back from writing by barriers such as ‘constant distractions and interruptions’, ‘family commitments’ and ‘workload’. Perhaps these individuals might want to dedicate long blocks of time to their research but have unrealistic expectations as to what they can achieve? Alternatively, they might face work burnout prepping for time out of the office. It will come as no great surprise that academics write more journal articles, conference papers and grant applications than anything else over the course of a career. 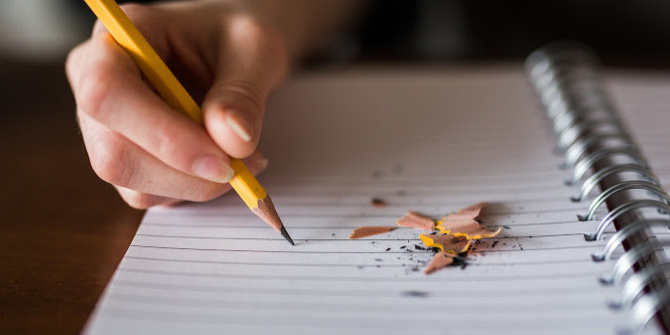 However, the research indicates that academics feel fairly neutral about these forms of writing – perhaps just seeing them as a necessary and therefore tolerable part of the job. The study finds high levels of satisfaction linked to writing books, monographs, book reviews and book chapters. In addition, as careers develop, we find a swing towards writing long-form pieces. As might be expected, in late career grant report writing declines but interestingly, creative writing increases significantly. Although we found that in general, academics experience the lowest levels of satisfaction at the beginning of a career and the highest at the end, the data suggests a range of factors are at work. Just because an academic has more experience doesn’t mean they’re better able to cope with the stresses and strains of academic life and just because an academic has limited experience doesn’t mean they’re less well equipped. There are young scholars who are both happy and productive and old masters who are miserable and blocked. We found that the academics who considered themselves to have a writing system of some kind were far better able to cope with barriers and blocks of an academic writing life. We call a writing ‘system’ the combination of personal tactics, routines and habits that academic authors have developed to help them get down to work. We found that when an academic has a writing system – even a very simple one –, they’re more productive, more satisfied and feel under dramatically less pressure to write. The key to doing anything well is doing more of it. Studies find that whether you’re conducting scientific research, learning a musical instrument or improving your golf swing, practice (and especially deliberate practice) makes perfect. The world isn’t short of academic journals and scholarly articles that’s true, but it is always in need of radical new concepts and breakthrough ideas that comes through deep, concentrated work. For us, academic productivity isn’t about producing more papers for the sake of it. It’s about producing more with a view to improving quality and finding excellence. And that’s what publishers, institutions, educators – all of us – should be interested in. This article is based on research led by Prolifiko and is being presented at the London Book Fair, the survey was co-designed with Christine Tulley, professor of English and director of the Masters of Arts in Rhetoric and Writing programme, Findlay University and Dr Lettie Conrad, publishing consultant, North American Editor for the ALPSP journal and advisor at Deepdyve. Data was collated and analysed by head of insight at De Gruyter Academic Publishing, Deirdre Watchorn. Image credit: Thought Catalog, via Unsplash (licensed under a CC0 1.0 license). Chris Smith is an entrepreneur, writing productivity specialist and co-founder at Prolifiko, a consultancy and services organisation improving the performance and productivity of writers and content creators. Former founder of Swarm Communications and ex associate director at Citigate Dewe Rogerson he’s worked in senior communications roles for startups, media businesses and tech companies. He has a background in content strategy, copywriting, PR and brand. He’s also a former lecturer in continental philosophy. Very interesting and yet the analysis seems to flip flop between productivity and satisfaction. It’s clear from what’s reported here that these 2 things do not align raising the question, is higher satisfaction worth the slight drop in productivity? I also note that you treat daily, time blocking, and summer/sabbatical as separate strategies. Was this a finding of the research or do many authors in fact combine them?